Driver Frank McGeown was the son of Bernard & Sarah McGeown (nee Murphy), Loy Street, Cookstown. Prior to active service he worked in Cookstown Pork Factory. 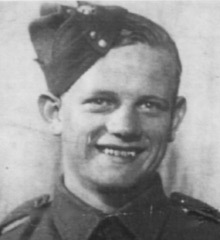 He died on 17th March 1945, aged 21 as a result of a road accident. While acting as a dispatch rider his motorcycle collided with a lorry in England. His remains were returned home to Cookstown. Derryloran (Chapel Hill) Graveyard lies on Westland Road South in Cookstown. There are three CWGC casualties in this graveyard, one from World War One and two from World War Two. 1 War Graves Photographic Project Gravestone photo of Frank McGeown can be purchased here.